A sports journalist decides to become a football quarterback to get inspiration for a new story, totally unaware of the gruelling training involved and the less-than-friendly attitude of his team-mates. Comedy drama, starring Alan Alda, Lauren Hutton, David Doyle and Alex Karras. 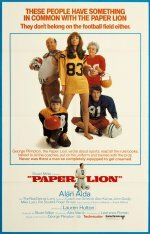 This engagingly good-tempered "mockumentary" is a loose adaptation of sports writer George Plimpton's bestseller about his time as quarterback for the Detroit Lions American football team. Technical knowledge of the game is unnecessary because Alan Alda, in his first starring role, interprets for us through his naive, amateurish actions, while Lauren Hutton is a pleasure to watch as Alda's secretary. There are also cameos from middleweight boxing champion Sugar Ray Robinson, and other American sporting heroes. Certainly makes a refreshing change from wall-to-wall football coverage.